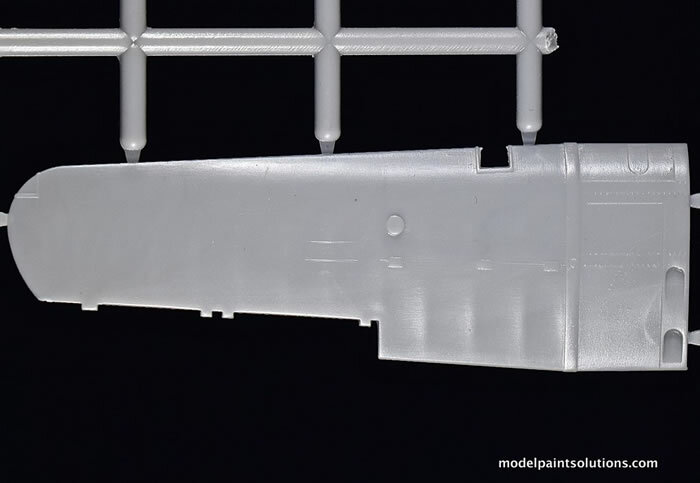 49 parts in grey styrene, 8 clear parts, and one PE fret with 20 parts, canopy masks, instrument panel film, and one decal sheet with markings for 2 airframes. The kit has nicely recessed details, panel lines, and rib/fabric surface textures. A well-detailed cockpit assembly along with separate flaps, ailerons, and rudder are included. Some parts have a bit of flash and a cutout for the landing light housing will have to be cut into the leading edge of the right wing. This is a great little kit of a very nice looking airplane. Although it’s a limited-production model, I see no potential issues or pitfalls that are beyond anyone with a little patience and experience. The Percival Proctor was a single-engined, low-wing monoplane with seating for three or four (depending on the model) that was used as a British radio trainer and communications aircraft during the Second World War. The Proctor was developed from the Percival Vega Gull in response to Air Ministry Specification 20/38 for a radio trainer and communications aircraft. To meet the requirement, the Proctor had a larger rear cabin windows and a fuselage that was six inches longer than the Vega Gull. Modifications permitting the Proctor to carry military radio gear and other equipment were also made. Of note, the seats were altered so as to allow the crew to wear parachutes. In early 1939 an order was placed for 247 aircraft to meet operational requirement (OR)-65. The prototype aircraft, serial number P5998, first flew on October 8th, 1939 from Luton Airport. The type was quickly put into production for both the RAF and Fleet Air Arm (FAA). The prototype was further tested as an emergency bomber during 1940 but this idea was abandoned as the invasion threat receded. Although the first 222 aircraft were built by Percival at Luton, most of the remaining 812 aircraft (of several marks) were built by F. Hills & Sons of Trafford Park near Manchester between 1941 and 1945. Whilst the very early Proctors (Mk’s I, II’s and III’s) followed very closely the last incarnation of the Vega Gull, and consequently retained most of its performance, later versions became much heavier and less aerodynamic, with inevitable detrimental effects upon their performance. Although looking broadly similar, the later marks of the Proctor represented a complete redesign of the aircraft that was larger, heavier, and less efficient. Flight performance deteriorated. Plans to fit the Proctor with the 250hp Queen 30 and a larger airscrew were considered but only one trial aircraft was so fitted. At the end of the war, many early mark Proctors were sold on the civilian market and were operated in Australia, New Zealand and Europe. 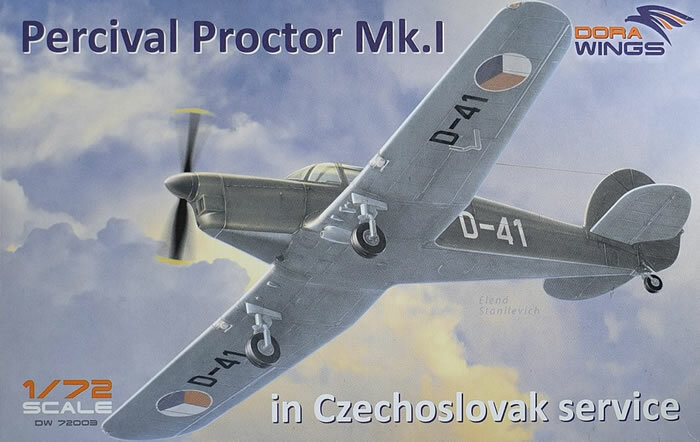 The Proctor Mk IV continued in service with the RAF until the last was withdrawn in 1955. Unfortunately, civilian-owned Proctors were grounded in the 1960s due to concerns about degradation of glued joints in the wooden airframes. Several surviving Proctors have been rebuilt with modern adhesives and should be returned to the air shortly. Early Proctors still make good light aircraft, as they combine the Vega's attributes of Long-range, speed and load-carrying ability. Notably, all Proctors in inherited the Vega Gull's wing-folding feature. P.28 Proctor I - Three-seat dual-control communications and radio/navigation trainer for the Royal Air Force, 147 built. P.28 Proctor IA - Three-seat dual-control deck landing and radio trainer the Royal Navy/Fleet Air Arm with dinghy stowage and naval instruments, 100 built. P.29 Proctor - One aircraft converted to a light-bomber to carry 16 20lb bombs under the wings. P.34 Proctor III - Three-seat radio trainer for Bomber Command radio operators, 437 built. P.31 Proctor IV - Four-seat radio trainer with enlarged fuselage, 258 built. Proctor 6 - Floatplane version, 1 built. P.46 - A Proctor IV fuselage was modified with a new-wing built by Heston Aircraft as the Youngman-Baynes High Lift Monoplane. Fast-forward forty years and there I am at Skyway Model Shop perusing the new release shelves when a familiar name catches my eye in an unfamiliar box: a Percival Proctor Mk. I. by Dora Wings. It was immediately purchased, with my own memories of the old issue of RT magazine taking center stage. In the ensuing years, Carl Vincent had become a friend and he had sent me scans of the photos from that article. Of course I had located a Frog Proctor on E-bay, but, well…it is a Frog kit…and I had never worked up the courage to begin. Dora Wings is a newer model manufacturer from the Ukraine and all signs pointed to them producing nice models. 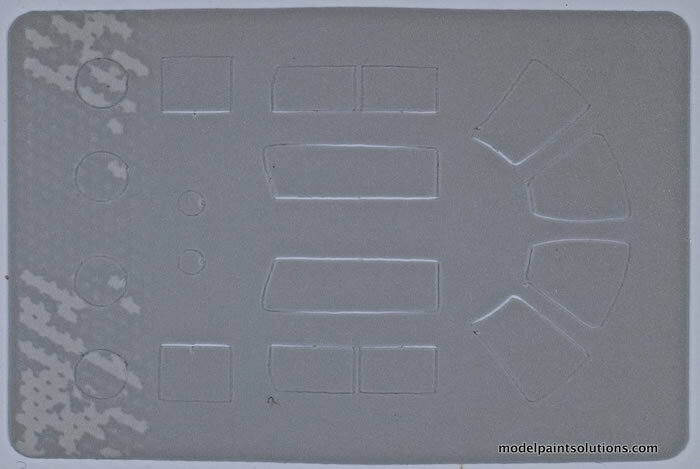 Upon lifting the lid of the smallish box, I found three grey sprues, one clear sprue, decals, a set of vinyl masks, a film instrument panel, and a small photo etched sheet. 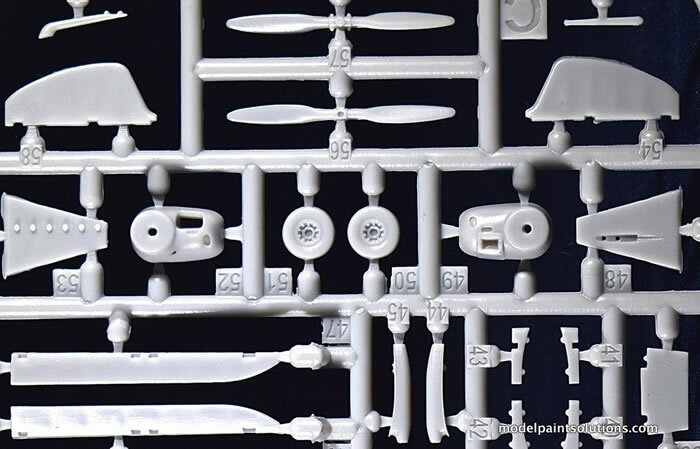 The instruction sheet with black and white drawings includes sprue maps, 20 assembly steps, as well as color profiles for the two decal options provided. John Adams of Aeroclub fame is named in the instructions as assisting with research, so we can assume the model is as accurate as possible. While this is a limited run kit, the moldings are impressive. 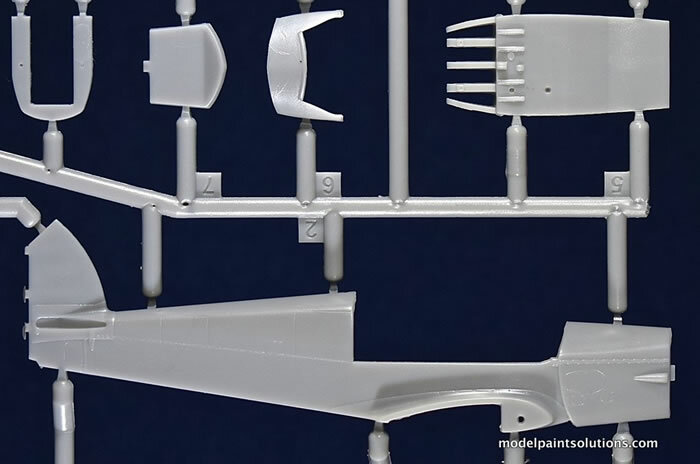 One sprue consists of the upper and lower wings and the tooling of the ribs and fabric is very impressive for the scale. 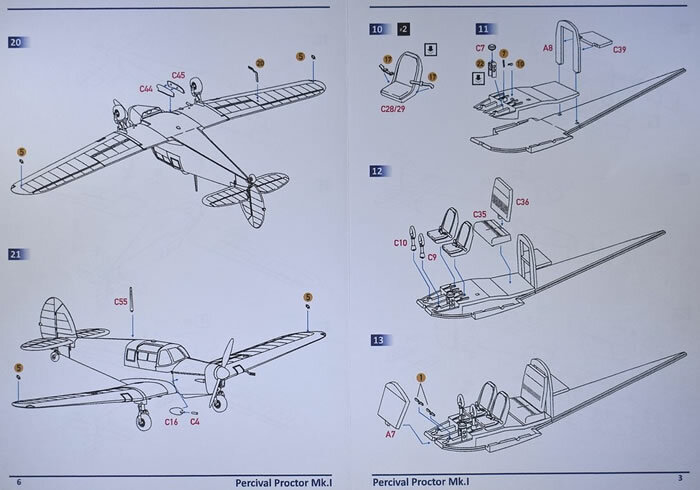 The second sprue consists of the three-part fuselage and some cockpit parts, while the final sprue includes the detail parts including separate flaps, ailerons, and rudder. The Ukrainian mold makers have really upped their game, and while there is a small amount of flash on a few parts, this is nothing like some of the older A-Model and Roden kits of yore. 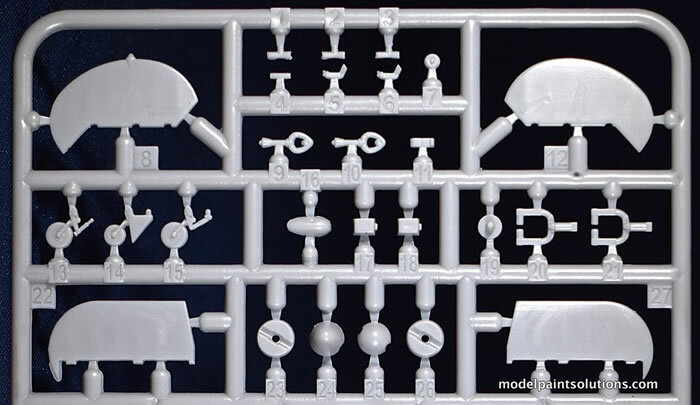 In fact, I would say it is as impressive a set of molding as any I’ve seen in a short run kit. The panel line detail is restrained, but very fine…maybe too fine for a ham-fisted modeler such as myself. 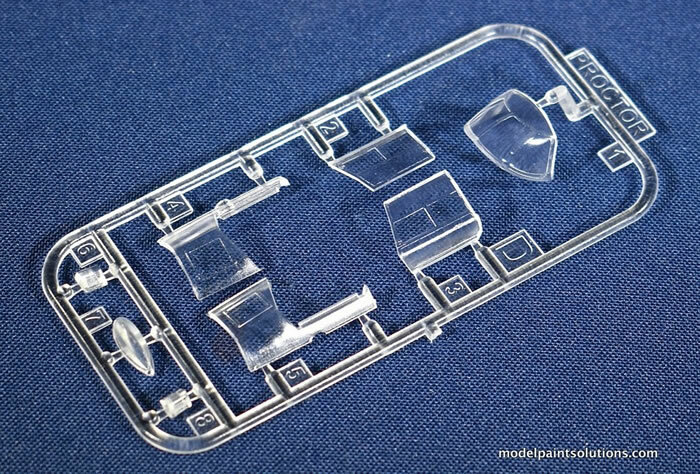 The clear sprue is reasonable, but not crystal clear, and would probably benefit from a dip in a clear gloss of your choosing. The photo etch fret provides detail for the cockpit along with some exterior details such as the pitot tube. The cockpit is impressively detailed which benefits a small cabin aircraft with much glass. Optional parts include tail wheels, propellers, seats, nose bowls, and spatted or exposed landing gear. (Many of these parts could be for used on the civil Vega Gull that I am sure will be released in the future.) About the only issue I see is that while the landing light cutout is provided in the left wing, the modeler will have to cut out the housing for the right wing. 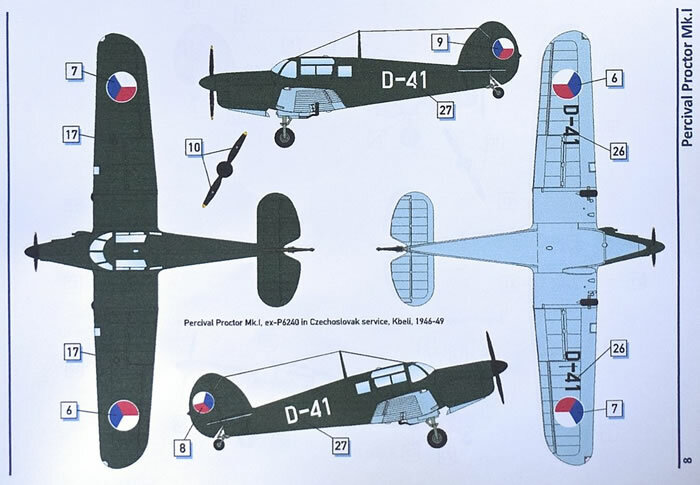 The decals include a Czech aircraft in green over blue and a RAF machine in Dark Green/Dark Earth over Trainer Yellow. 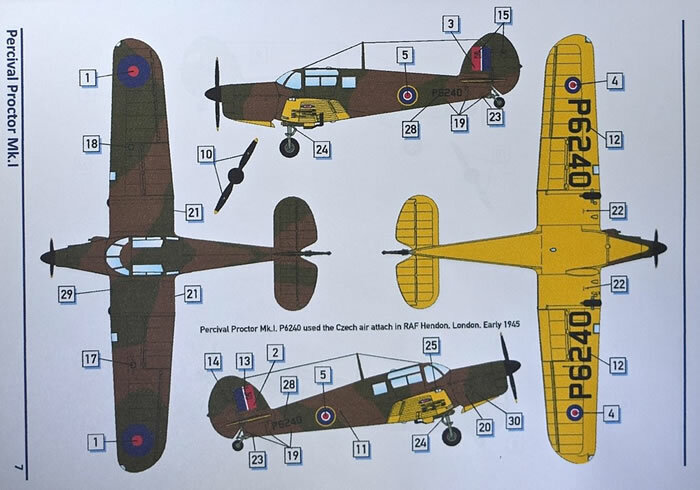 Decals look well printed and include serials, roundels, and stencil data. Is the Dora Wings kit an improvement on the Frog Proctor? Of course it is! In fact, it is one of the nicest short run kits I’ve seen in a while and I hope Dora Wings will issue additional interesting and unique aircraft in 1/72. I’m impressed and can’t wait to dig in. P.S. Speaking of the Matchbox Provost, has anyone ever seen any photos of Provost XV418 during its time in Canada in the early 1950s for cold weather testing?